This issue came out about Halloween time, but there is nothing to commemorate Halloween in the issue. The nearest to it is the mini-monster feature. 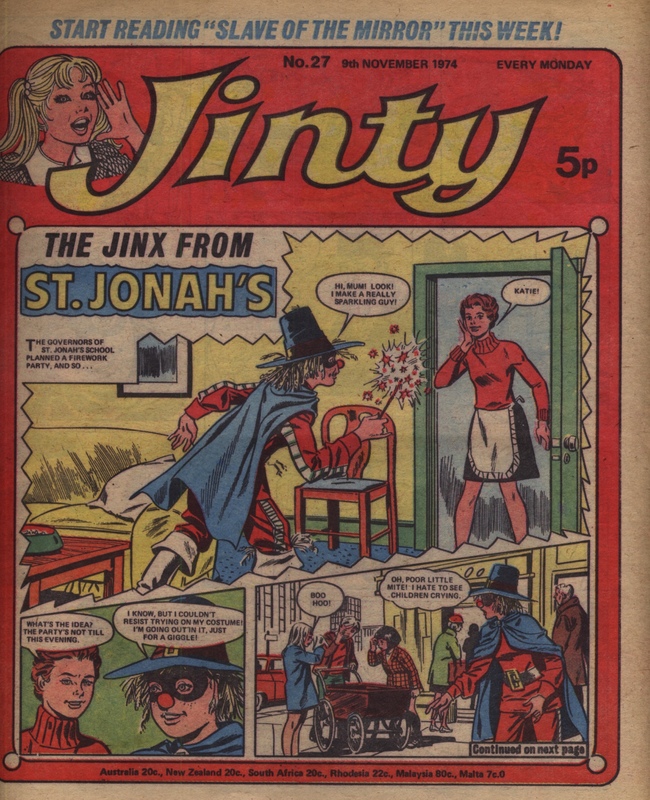 However, the issue promises that the Guy Fawkes issue next week will be a sparkler, and in more ways than one – because that is when the Jinty classic, “Land of No Tears”, starts. Alison Christie’s other story, “The Goose Girl”, is now on its penultimate episode. Glenda wants to go for an interview to get the career she wants. Unfortunately, her impossible mother messes everything up by sending her off to another interview because she is still pushing her into fashion design. “Destiny Brown” also messes things up because she misinterpreted what her second sight was telling her – again. This time it screws up the chance that she and her father had of escaping the criminals who kidnapped them. Fran and Co are off on a camping trip. But the outfits Fran picks show how ignorant she is about camping or country life, and it’s causing some embarrassment. The mystery of the frightened girl deepens in “Stage Fright!” when Linda tries to reach out to her, but gets rebuffed. Linda turns to the mystery of the acting trophy instead and finds a clue there. And in “Guardian of White Horse Hill”, Janey’s emotional state gets so bad that her foster parents decide to send her back for expert help. Janey gets even worse when she overhears this; what will it drive her to do next week? In the Gypsy Rose story, Tracy Gray discovers a window that can show her the past and the story of a stern father who is coming between his son and the girl he loves. But the story gets altered for the worse when a replacement pane from an evil house is fitted. Can the story be put right before the girl gets murdered? Henrietta takes exception to Sue’s nail polish and her showing it off at school (um, isn’t nail polish banned in school? ), and casts a spell in response. However, things rebound a bit on Henrietta when the spell has unexpected results that have her giving up in the end. I can’t remember quite what recently triggered in me a memory about the OuBaPo movement, but I’ve been thinking about it, and similar comics experiments, for the past few days. You may perhaps have heard of its older sister movement OuLiPo, or at least of some of the works produced from it: it stands for “Ouvroir de la Litterature Potencielle”, which means ‘Workshop for Potential Literature’, and it’s about how choosing constraints in your story telling can lead to huge creative potential. One of the best-known OuLiPo texts was Georges Perec’s “A Void” (La Disparition) from 1969, written without using the letter E in the entire book. It may sound like a foolish trick to use, but in fact it means the author has to be particularly clever in using good circumlocutions and paraphrases. OuBaPo (invented much later in 1992) applies similar principles to comics; the creators use constraints in order to experiment with their comics creation and maybe come up with ways of doing things that they never would otherwise have thought of. 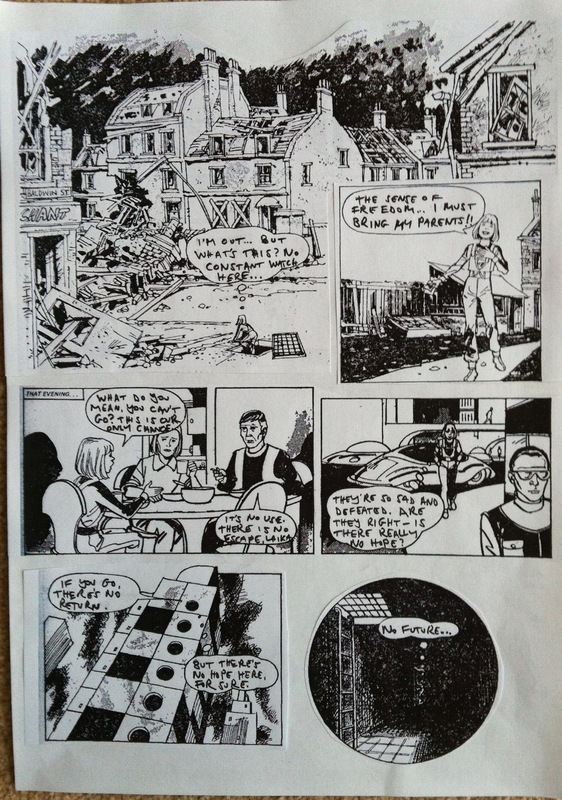 American cartoonist Matt Madden re-used an OuLiPo idea in his “Exercises in Style” where he took a simple story in comics form and re-told it in multiple different ways – as a superhero story, as described by a third party, from a different view point, telling it all in one big panel, telling it in many small panels, and so on. OuBaPo constraints can also include tactics such as summarizing an existing story in only a few panels, creating a palindromic story, or repeating a drawing throughout the story to produce an effect like alliteration. Of course it’s not only the OuBaPo movement that has been experimenting with comics and story telling: Scott McCloud invented a Dadaist game called Five card Nancy, based on Ernie Bushmiller’s already-surreal comic strip, and games such as comics jams have been around for a long time (typically in the collaborative story-telling format where one person draws a panel of the story and passes it onto the the next cartoonist, and so on until a 9 panel grid has been filled up – one UK example was the Sisterson! comic). So these can be useful games that allow people to join in creatively when they might otherwise discount their own abilities. I think they can also potentially highlight some of the more hidden aspects of the comic being looked at. Consider the text-only version above – protagonist Jean is the only person whose thoughts we see via thought bubbles, which is something that is discussed in the story analysis but is perhaps clearer here than just looking at the page as published. For a long time, I’ve been wanting to see how one particular OuBaPo game, that of Reduction, would work with a Jinty story; and if it would reveal anything about the underlying story telling. This is an exercise where you take the original published version and remove the majority of the panels making it up; obviously you then have to re-do the page composition to make a new page or pages. I’d figured it might be a case of taking the first and last panels out of a Jinty page, and so on throughout the whole story – you’d end up with a very compressed version of, let’s say, “Children of Edenford”. Would the story still make sense, or would too much be lost for you to end up with a reasonable end result? That might tell you something about the original story’s style – a Manga style story might lose much of its atmospheric mood-setting but still be comprehensible; a surreal story might still be just as surreal; while a tightly-plotted story might be mostly incomprehensible if the creators had succeeded in making every single panel count and make a difference. Well, I got a chance to try it this weekend, albeit less extravagantly than recreating a whole story. Staying at a chum’s house I took part in a semi-regular event called the Midwinter Comics Retreat, where the aim is for all of us to create a comic collaboratively over the weekend; the structure of this allowed for self-contained stories to be produced so I finally had a go at taking a Jinty story and reducing it down. 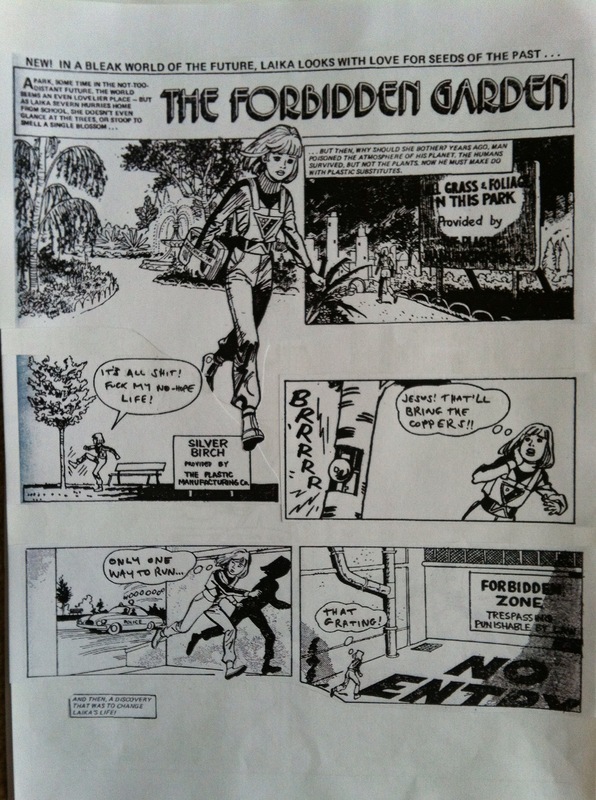 Here (with apologies for the duff lettering) is a compressed and altered version of “The Forbidden Garden”. It’s quite hard to do, actually, and that’s part of what you learn from this. Taking the first and last panels from a page isn’t straightforward in this sort of comic, because the artists often don’t use square panels or a regular grid – so in most of the cases I took a strip of two contiguous panels. Fitting in words into the (tiny!) speech bubbles is hard – which few words will say what you want, and work with the panels either side of them, too? 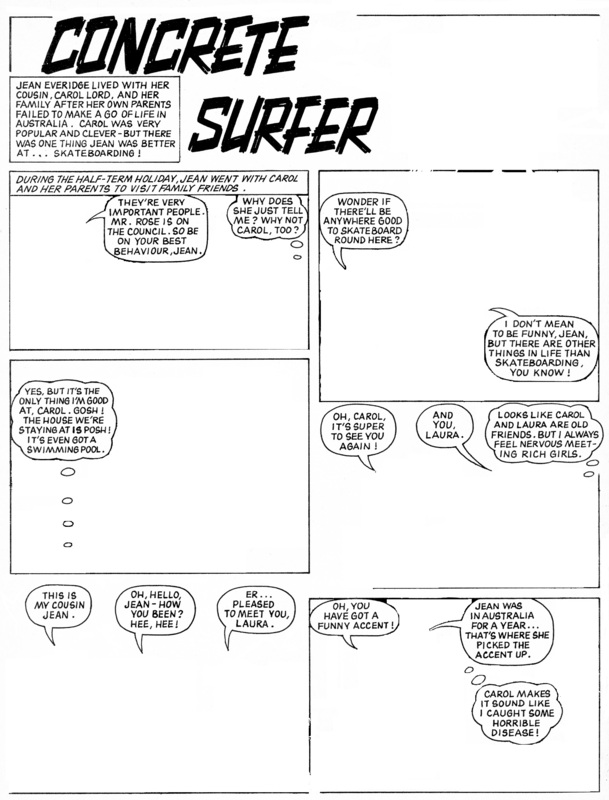 The original creators had a bit more latitude because they could rearrange the panel to allow a bit more room here or a second speech bubble there. I ended up with a story where Laika still hates the world she is stuck in, but her primary drive is to escape rather than to save her sister (who has in this version literally been cut out entirely). It is still a dystopia, but if anything is even bleaker than the original (and I let myself swear, in a punky spirit). Of course I was only using the first episode as a basis, so I didn’t have any of the uplifting resolution to play on! I would like to play with this more, but it’s quite hard to do – the two pages above took the best part of an evening to create, even working with pre-supplied materials. I’d like to try some more reduction, but perhaps also some palindromes (a story that reads backwards and forwards, panel by panel). Some Jinty stories end up very much where they started from and others have huge character developments included within, so a palindrome could highlight that circular structure – or show how the published ending perhaps is only superficially similar to the starting point, after all. Edited to add: more OuBaPo experiments have been posted by Mistyfan here, here, and here. The red, green and yellow colourings on the cover make it a standout. The winter sport on the cover blends in with the winter months when the issue came out. It is the final episode of Pam’s current story, where she sets out to prove her cousin Veronica is a big fraud. And she sure needs proof, because even her best friend Tracy doubts her. Ferne’s secret dancing in the ruins sets off funny rumours in the ballet school. And it can only get worse with Ferne secretly roaming around the school while deciding to carry on with her deception to punish her father. Sir Roger’s mother descends on Stoney Hall. She is a dragon who haunted Sir Roger while he was alive and is now haunting him in death. But she has nothing on Gaye. Tansy tries out for the school choir – just to get out of French lessons – but everyone is running a mile when they hear her sing. Things are really stepping up in “Land of No Tears” when Cassy hears about the Golden Girl Award and decides that winning it is the only way to get better treatment for the Gammas, who are subject to indignities such as eating only scraps from the Alpha girls’ plates. And now she’s discovered a way into the Alpha girls’ gym for secret training. Marie saves a boy’s life, but has to refuse the medal for bravery because of her jealous godmother, who says “No Medals for Marie” or no inheritance of her hall that Marie’s sick brother badly needs to live in. It’s netball vs basketball in a stuffy boys’ school in “Life’s a Ball for Nadine”. But it’s disco that wins the day (while the coaches aren’t looking). And the Gypsy Rose tale is another recycled Strange Story, about an odd case of time travel during a marathon drive that sets a guilty conscience at rest. This issue sees the conclusion of the Venetian Looking Glass – and one of the most gruesome panels to appear in Jinty when Lucy opens her namesake’s coffin to put in the things to lay her ghost, and is revolted by the sight of her skeleton. Pam has realised one of her classmates is shoplifting and doesn’t know what to do. And to make matters worse, Pam was given one of the shoplifted items, but trying to return it quietly has gotten her into trouble with the shop management, who think she stole the item! Tansy is in the doghouse after she loses her neighbour’s treasured memories. Even the teachers at school are rubbing her nose in it. Fortunately the treasures are recovered and it turns out they weren’t all that lost. But in “Blind Faith”, Clare has an even more heartbreaking loss – her dog Caesar, who has accidentally been shot dead. In “Minnow”, Minna’s swimming teacher decides it’s time to ask Minna’s mother what light she can shed on Minna’s strange panics in the pool – but she doesn’t know Minna is swimming behind her mother’s back, so Minna’s secret is in danger! The Gypsy Rose story recycles another Strange Story, about how will o’ the wisp saves a fugitive from Norman invaders. But the panels of Gypsy Rose that replace the Storyteller must rank as one of the worst instances of Jinty artwork ever. In “A Spell of Trouble” Carrie gets even more infuriated with her gormless cousin Angela when Angela tries to impose her taste in television upon her – a cartoon called Marmaduke Mouse (oh, really, Angela, at your age!) instead of the pop programme that is Carrie’s favourite. Sir Roger is not impressed with Americans – and even less so when a Texan wants to buy Stoney Hall and ship it to Texas! We have to wait until next week to find out what Sir Roger and Gaye do to prevent this. And haunting the Texans won’t work because they love having “a real English spook!”. The Goods News for All Readers blog has recently done a Halloween post about Misty; in the comments on that post, and on a related post on the Comics UK forum, a few of us have had a brief discussion about one-off stories, series, and regular characters. Different titles create different balances between the various kinds of comics: Misty has always struck me as having a strong focus on one-off (complete) stories in a way that Jinty didn’t, so that is an obvious comparison between the two, but there are other groupings that could be usefully looked at too. 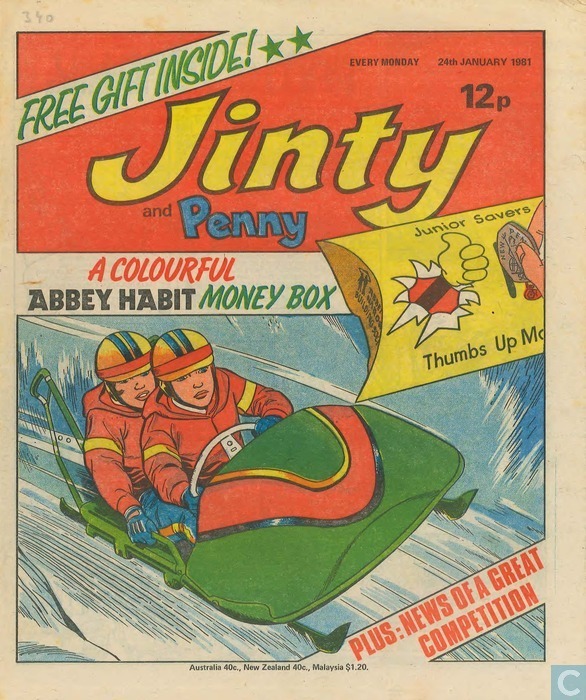 One-off stories / complete stories haven’t ever been a big focus in the pages of Jinty, except for in annuals or summer specials which are by their nature reliant on complete reads. Indeed, I wonder whether the two examples that come readily to mind – “Mimi Seeks A Mistress” and “Holly and the Ivy” – might have been originally written for publication in an annual and for whatever reason then been included in the weekly comic instead? ‘Storyteller’ / framed stories are stand-alone stories that still fit into some sort of structure or framing sequence. Gypsy Rose is Jinty‘s most obvious example, but I would also classify “Is This Your Story?” and “Thursday’s Child” within this as being complete stories that may not have a narrator but do have a constraining element to them that means you have a certain sense of knowing ‘what you’re getting’. In a Gypsy Rose story you know you’ll have a spooky element, but also a sense of safety; the protagonist won’t herself suffer an awful fate. In 2000AD‘s “Future Shocks” there was no such guarantee, but you did know it would generally be an SF story rather than a horror story or a morality tale (as “Is This Your Story?” was). Both the entirely stand-alone and the framed stories have the advantage editorially of great flexibility – they can be run in any order so it doesn’t matter if one story is not ready for printing that week, you can try out new artists and writers, you can try out new directions and ideas. This flexibility can also lead to problems – the results can be uneven in quality or interest level, or overly repetitive. I would also say that to my mind they’re a bit too easy to put down and not feel that motivated to pick up again – even if you know that Gypsy Rose or Future Shock stories are generally really good, to me they don’t have the “must read” factor that a cliff-hanger ending to an earlier episode gives. 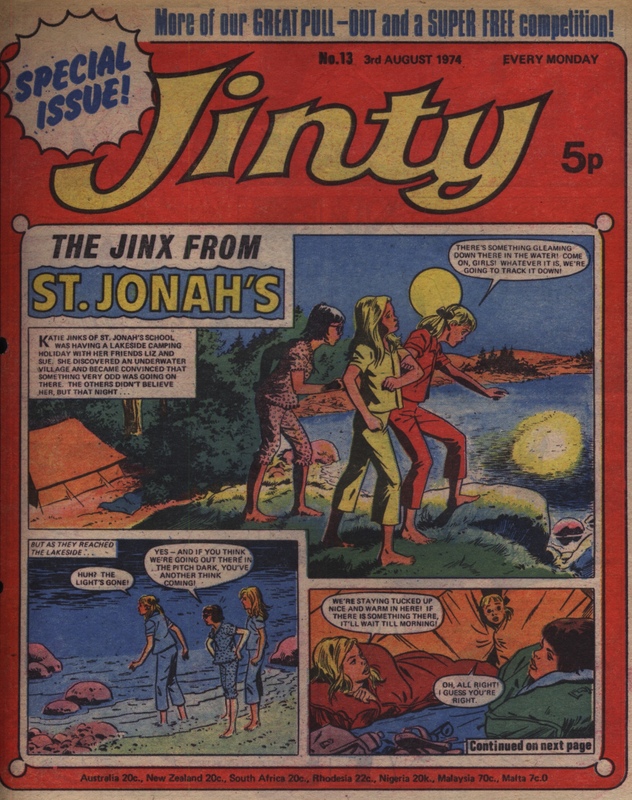 Serial stories are Jinty‘s bread-and-butter, but if you count up the number of series in a given issue it is not given over totally to them: 23 February 1980, for instance, has 5 serials out of 8 stories in comics format. I am here using the phrase ‘serial stories’ meaning stories that run over more than one week with a beginning/middle/end narrative structure. The way the ‘end’ element works is important because Katie Jinx or the Four Marys also have stories with endings, but they aren’t final – we know that next week they’ll be back with more, which is what makes them ‘regulars’. A serial story has a lot of degrees of freedom: it can be a story about a ghost or a horse or a superheroine (or maybe a ghost horse or a horse superheroine). What it can’t easily do is change tack dramatically once the story starts; the start of the story sets it into certain tracks and certain expectations. The strength of the serial is the length of time that it has to develop a story and to really hammer it home, or to twist and turn surprisingly. It also has the freedom to change the situation of the characters in the story: it can end with them healed, or vindicated, or with the protagonist growing as a person. A complete one-off story doesn’t have enough length to develop that sense of change, and we often don’t know enough about the character to even care that much if they grow into a better person. A story with a regular character, contrariwise, has to ‘reset’ at the end of each episode or each multi-episode story, so that as the next story starts it can pick up more or less from the beginning again. There are still weaknesses in the serial story format, of course. It can get too long and lose its way; it can be too short to let itself develop properly while not benefiting from the punchiness of the self-contained story. 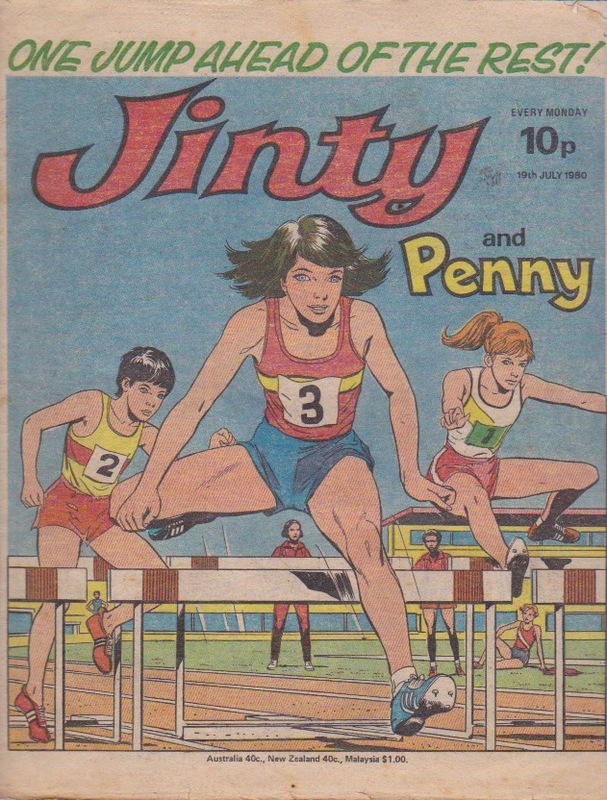 Jinty also has a couple of cases of returning characters, where the original series gets a second, follow-up story. There aren’t many of these – “Fran’ll Fix It!” gets a second run, and so does “Daughter of Dreams”. Each story is a complete serial in itself, but because the character or the story was popular, they returned for another go. One option would be to reprint the original story, which Jinty did a few times; but if the story structure allowed it then a whole new follow-up story might also a possibility. Some stories would be better suited to this than others – a sequel to “Land of No Tears” wouldn’t be impossible to imagine but would require quite a lot of changes (someone from the dystopian future travelling back to the past, perhaps? ), while a sequel to “The Robot Who Cried” wouldn’t be that hard at all to do (her adventures at school as an acknowledged robot, and how other people reacted once she had no secrets left to hide?). A regular character may have short complete stories like “Sue’s Fantastic Fun-Bag” or individual longer story runs as in “No Tears for Molly“. Either way there is no real change in or development of the character over the time her story runs. “Merry at Misery House” was also basically a regular, with story arcs; you don’t really get a sense of a planned resolution that Merry was struggling to reach from the start of her story, it’s just… time to wrap up the story so her mum and dad announce that her name has been cleared, bang. They can be great fun reads, with a real comfort factor – we can get to know the characters well, and look forward to seeing them again, like old friends. That is really the draw of regulars; like reading a beloved Chalet School book, we know what we are getting and that we will enjoy it. The characters can develop some strong external recognition, too – the interviewees in Mel Gibson’s “Remembered Reading” consistently mentioned long-running regulars “The Four Marys”, and “Bella” from Tammy. On the down side? If the reader just isn’t that interested in the character in the first place, or doesn’t find their antics funny, it ain’t likely to change for the better… The main counter-example I can think of in this area is 2000AD and Judge Dredd in particular: he is a regular who has turned into a proper, fleshed-out character with a backstory, a life, and unpredictability. Through him now, all sorts of stories can be told. The Four Marys changed their uniforms and were updated to become more modern on the surface, but never changed their fundamental natures – and that is much more the usual case with regulars. At the end of the day, a weekly publication needs a balance of different types of story, not just thematically, but also structurally. There are other types of story structure that I don’t know of within girls comics: is there an example anywhere of the Buffy tv story structure, where individual self-contained stories build up in an overall arc to a series finale? I’m sure there are other kinds of structure in girls’ comics and elsewhere: what can others think of? Edited to add: I have thought of another kind of story structure – Worldbuilding, or Shared worlds. This is where the reader is shown an imagined world that is developed in story after story. Perhaps one set of creators are mostly responsible for writing and drawing that world, or maybe a number of different creators add their own influences to the world. In traditional British comics, I guess that Dan Dare inhabits this sort of built world, though I’m not that sure as to how much of the world we see outside of stories focused on Dare himself; it is at least a strong enough world in itself for Grant Morrison and Rian Hughes to develop their own take on it in Revolver’s “Dare“. 2000AD does a lot of this worldbuilding: what else is Judge Dredd’s universe of Megacities, isocubes, and the Cursed Earth? But in traditional girls’ comics I’m not sure I can think of any examples. This is a big shame I think as this would provide not only very fertile ground for telling stories but also a lot of ongoing reader loyalty in the way that 2000AD has seen over the years – eventually even moving into mainstream acceptance. Edited further: Lorrbot points out in the comments that there are also examples of Spin offs, where the characters in the original story generate stories with further characters from that setup. It may not be the same case as Worldbuilding, if there is no very obvious effort to invent a whole new world different from ours, but it shares some characteristics with this.